Addendum: I don't know much about tagging but was told I have to tell 7 things about myself. 1. I was born and raised in the Motor City! I'm a city girl for life!!! 6. I love my career path! I believe therapy/counseling heals! Yeah, I've been neglecting my page for awhile and I was called out...lol...thanks AYA:-) My hair is just continuing to grow, grow, grow, and I can't seem to do anything about it. I was thinking of cutting the length a bit but I am so curious to see how long it can get. 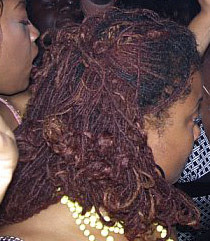 Several people have contacted me about Sisterlocks so I guess they still look nice. I still love them and have no regrets at all about my choice to get them. I'm on my third consultant. I loved all my consultants but one retired, then I couldn't coordinate my schedule right to continue to go to my second one, and now I've found one very close to home!!! Here are some of the most recent pics of me freestyling and styled. As always your hair looks gorgeous! Girl, you look great!! So glad I could nudge you out if hiding (-: Don't forget, you need to write 7 things about yourself, and tag 7 different people. Thanks for the updates! Your hair is looking fabulous as always. I love the styling you've done in all your pics. Your hair really has grown over this year. Good to see & hear you was wondering where you were??? How did I miss your blog? 31 years old, you look like a teenager. I didn't learn how to ride a bike until 14. Emotional healing/therapy worked wonders for me when my job had me stressed out. I'm able to deal with sticky situations without raising an eyebrow now. skkkkeeeeweeee but i aint doin no more tags.